Thank you, all. And thank you, Dean Tempel, for this great honor you’ve conferred on me today. 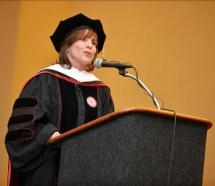 On this happy and hopeful occasion, it is truly my delight to be here with you at Indiana University - Purdue University Indianapolis… the school with the most letters in its name… and the most talented women and men of letters to its name. To the graduates, friends, family, fathers I say congratulations. And – especially today, of all days – to my fellow moms: I can’t think of a better – or more fitting – Mother’s Day gift than you are receiving today. Congratulations to you and Happy Mother’s Day! So, graduates, if I were sitting in your seat right now I’d be thinking: what is she going to say today that will really matter anyway? Well, it might surprise you to learn that the subject I want to talk you about today is simply the subject of “Normal.” Really. What do I mean by that? Well to start with, I’m kind of uniquely qualified to talk about this topic since I was born in a small college town in the state right next door – in a place called, Normal, Illinois. But I left Normal in 1971 at the age of 11, and some who know me joke that I’ve been trying to get back to “Normal” ever since. But seriously, knowing as well as I do that I’m standing in the nation’s center of excellence in philanthropy here at Indiana University… an institution we at the Case Foundation look to for data, for analysis, and leadership… it is clear to me that by choosing to study here you have already set your sights abnormally and exceptionally high. So … what I want to talk to you about today is setting those sights on redefining "Normal" for the 21st Century and just maybe for all time. Your area of study, focus, and hopefully passion – that of philanthropy – simply could not be more important. Why? Because the traditional models are broken. The old way of doing things no longer works. To address today’s daunting challenges that dog our communities and our planet, we need to retool, rethink and reinvent. It’s time for us to be bold… to act with urgency… and to resist the tendency to let caution be our guide. 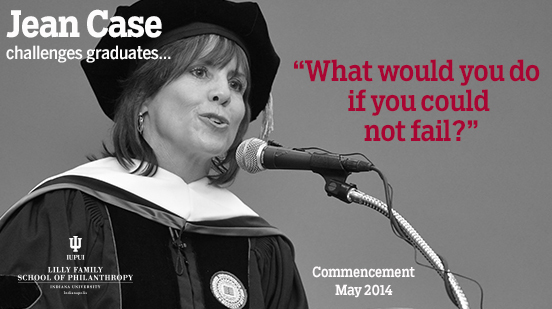 In short, as we go about addressing the world’s most daunting challenges, it’s time for us to Be Fearless. To that end, I want to pass on to you five principles – hallmarks of the most effective social movements and transformative breakthroughs of our time. At the Case Foundation, we try to incorporate them into everything we do… at every level of our organization. To us, these five principles define what it means to be fearless and effective social innovators. Principle #1: Let urgency conquer fear. I challenge you to consider your own big idea, and become the activist committed to urgently setting it in motion. There is nothing stopping you from assuming that same urgent mindset right now on things you care about. It is the crucial first step every great social innovator ever took. So don’t overthink. Don’t overanalyze. Do… and start doing right now as you leave this place. Principle #2: Make big bets and make history. When I talked about defining your own “big” idea, I meant it. If humanity is to meet intractable challenges like homelessness, illiteracy and climate change, incremental efforts won’t do the trick. Your goal must be absolute audaciousness. It was President Kennedy who said, “We go to the moon not because it is easy, but because it is hard,” at a time when our nation was utterly unprepared to do so. Less than decade later, we landed men on the moon and returned them safely to earth. Today at Google they are highly focused on what they call “moonshots” – audacious ideas that can benefit at least a billion people. What is your “moonshot” and how will you keep it in your crosshairs as you go forth? Principle #3: Reach beyond your bubble and take risks. Today, you are leaving the world where there is a business school over there… social sciences over there… and philanthropy here. A world where people are separated by their interests and passions. Tomorrow, these divisions can evaporate. Innovation often happens at the intersections between organizations… between committed people who bring differing backgrounds, skillsets and their own unique perspectives. So consider every opportunity to learn from and grow alongside people who come from other industries… other backgrounds… other geographies. Ask yourself, who is not at this table and whose voice isn’t being heard or which ideas are not being considered as you tackle big problems. Consider how powerful it could be for you to collaborate with an MBA grad to start a social enterprise to make sure every person in the world has access to clean water… or a public policy grad to make sure no one has to sleep on the street in your community again. The truth is, you don’t need to join a foundation to do the work of changing the world. You can be a changemaker in a corporate environment. Help steer their products and services. Or help start a new business that brings benefit to the world’s poorest populations. You can advise an investment fund. Help analysts find companies or bonds that bring a social benefit… while growing their portfolios. It will be up to you to take the concepts and methods you learned here… to bring your skills and experience to bear… and see philanthropy through every lens and make sure every sector is part of the solution. Principle #4: Take risks. Experiment early and often. In Silicon Valley, the common practice is to create a “minimum viable product.” The idea being, don’t wait for perfect. Get started, put stuff out there, see what works, refine it, measure what happens or how people respond, change it and learn along the way how to bring excellence. If we agree old models are broken, then we need to innovate. And if we are going to innovate, we must take risk, try new things. Don’t be afraid to go first. Don’t wait for the perfect solution you wish you had. Believe me: it can get messy along the way. And that’s exactly the way it should be. Principle #5: Make failure matter. You’ve already accomplished so much and have so much to be proud of. So it falls on me to encourage you to start failing on the road forward. Simply put, if you are innovating, you are taking risks. If you are taking risks, you will experience failure. Failure teaches. Learn from it. If it happens, fail fast, fail forward and use the experience to get closer to what WILL work. At the Case Foundation, we expect to have a few failures in the things we set out to do – not because we like to – and we don’t -- but because it is proof that our goals have met the minimum required levels of audaciousness. If we simply sail through everything without bumps, mistakes or failures along the way, we think we aren’t trying hard enough to bring transformative change. 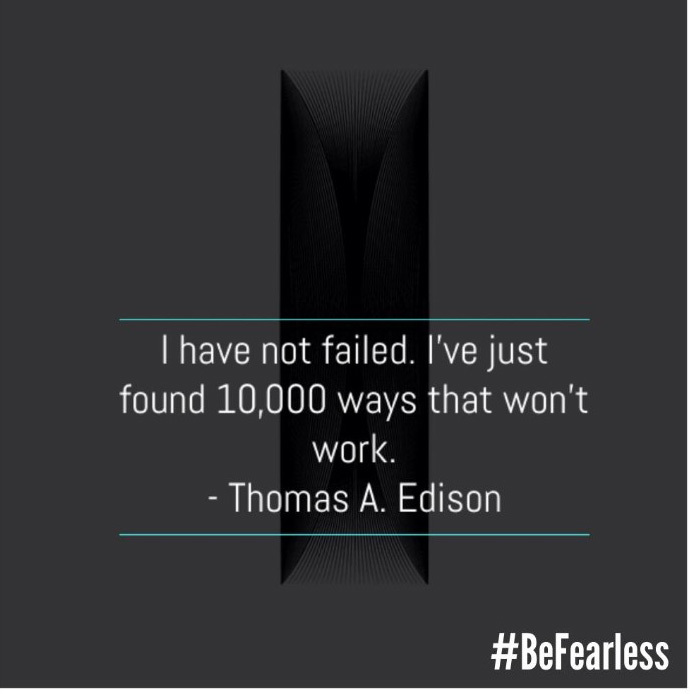 So when I say “be fearless,” I also mean feel free to fail. Because failure means you’re getting somewhere. So in closing, I just want to say, there is no GPS to your future. But if I could reprogram Siri for you, I’d have you hold the home key and have her remind you of the five Be Fearless principles: let urgency conquer fear … set audacious goals… reach beyond your bubble … experiment and take risks… and if you fail, fail forward. These are the hallmarks of the transformative breakthroughs that have benefited society. These are the principles you can combine with the concepts and methods you have learned here. I firmly believe they will help you converse and collaborate, and create a new and better “Normal” in the world – one that benefits humanity and dignifies all people. Put them in your tool box. And then, put them to work. Because there’s simply no time to spare. Where some see a cause, you here at the nation’s first School of Philanthropy see an emergency. So be the first responder. Bring your biggest ideas. And above all - be fearless. If the progress you make tomorrow can match the promise you have today, I firmly believe that your generation will become the next Greatest Generation. Thank you. Congratulations Class of 2014. And now go change the world!